" It's that time of year and many of you have been asking for snow and ice brushes. 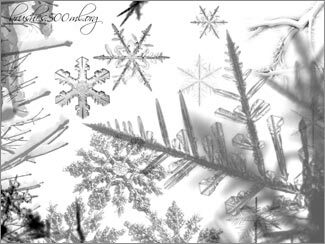 Well we're happy to announce that we have an exclusive Snow & Flakes Brush Set for you to download. This set was kindly created for us by Kirsty of 500ml Brushes. She's always been one of our favorite brush maestros (you can see a list of her other excellent brushes on our brushes page), and we're thrilled to be able to offer her truly amazing work to you. The Snow & Flakes Brush Set contains 10 individual brushes and is a real winter wonderland of snowy images, featuring icy trees, perfectly exquisite snow flakes, intricate ice crystals and more. Make sure to review the read-me file that contains certain usage restrictions, and then create your own spectacular wintery marvels to unleash on the world. Thanks Kirsty! 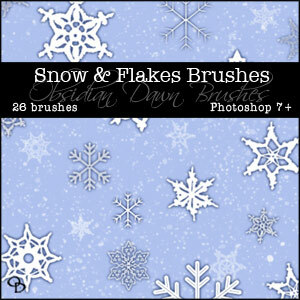 Download the Snow Flakes Brush Set (zip/1.3M). Read this article from creativepro.com - "I Only Have Ice for You" - which will show you how others have put snow and ice in their text. This set of Photoshop brushes is made up of various snow and snowflakes. This includes various flakes in different shapes, of course, but some of them are patterned, others are vector, some are crocheted, there’s some scattered flake shapes, as well as some made to look like real snow that you can add to any scene to make it look like it’s snowing! Not really any tips to go along with this one. Still on vacation! Hope that everyone enjoys, and Happy Holidays! Keep in mind that I have a few more snowflakes available in my Holidays Brush Set. Go to Alien Skin Software and download the 30-day fully functional Eye Candy 5: Nature. You'll be able to do lots of crazy snow effects with Snow Drift, which piles snow on any object, selection or text and sprinkles surfaces with light snow. And there's also Icicles, which drips icy stalactites from any selection and glazes surfaces with realistic ice. By combining Icicles with Snow Drift, you can quickly winterize text or photos. Study some examples of Snow Drift and Icicles to get some ideas. And our friends at Alien Skin Software have set us up with an exclusive special offer discount link that will give you some sweet savings at their online store. Just follow this link and you'll see 10% and 20% price drops on their products when you get to the Alien Skin Online Store area. Eye Candy 5: Nature  $99  our price $79. Well, that's all the snow I can come up with for now, but I'll keep looking!